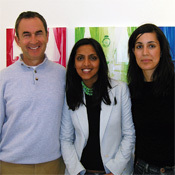 GERALD SCHWARTZ with art lovers Supriya Menon (MBA '05) and Avid Larizadeh (HBS '06). When Gerald Schwartz (MBA ’70) attended HBS, the walls of Aldrich Hall were bare. As a longtime art lover who began collecting in his early 20s, he wanted to change that. So in 1995, Schwartz inaugurated an annual gallery trip to New York to purchase contemporary art for HBS — an ongoing tradition that continues to change the look and feel of community space where students, faculty, and staff come together. While a visitor’s first impressions of the campus probably match the usual expectations of ivy-covered brick buildings connected by orderly pathways, a look inside any one of those buildings reveals a less traditional scene. Wander up to the second floor of Shad Hall, for example. Gracing one stairwell is Strive, a life-sized charcoal rendering on wood panels of an African-American woman by artist Whitfield Lovell. Weathered boxing gloves dangle from the panels. Further along are two pieces by the British photographer David Stewart. Selected from his “Fogeys” series, the first shows a rotund, elderly woman floating blissfully in a turquoise pool; the other depicts three old men in party hats dangling their feet into an open grave. “Mixing provocative, thoughtful art in amongst the students enriches the learning experience and sparks creative thinking,” says Schwartz, president and CEO of Toronto-based Onex Corporation. HBS director of planning Sharon Black accompanies Schwartz each year on the New York gallery trip; recently, two MBA students from the Art Appreciation Society have gone along as well. (The student group, founded in 2001, organizes outings to museums and galleries and arranges for artists to speak at HBS.) The gallery visits are coordinated by Gracie Mansion, an established dealer in the New York art world who has long been a champion of emerging, avant-garde artists. Before each trip, Mansion submits slides of artists’ works to Schwartz and the others to narrow the field further. Even so, this year’s group will consider some 150 works represented by nearly twenty galleries before making the final selections. The day begins at half past nine with a stop at the Bellwether Gallery, where we view Amy Wilson’s childlike paintings of young girls and skeletons. Dubbed “Grandma Moses with an Attitude” by the New York Times, Wilson creates tiny figures that spout finely painted lines of published text on topics ranging from the 9/11 terrorist attacks to the 2004 presidential election. The group decides on two of Wilson’s works, Invasion and Awake from Your Slumber, for $3,000 each. “As an educational institution, HBS should support young, developing talent,” says Schwartz. This is Wilson’s first solo show. The day wraps up at around five o’clock at a local cafe. Schwartz sketches out a quick tally, figuring he’s spent $67,100 on fourteen pieces. He seems pleased with that ratio; eight of the artworks were acquired for under $5,000 each, with the most expensive purchase topping out at $11,500. Factor in the number of students, faculty, and visitors to HBS who will enjoy and reflect on that art over the years, and you have a very good ROI.